I got to work at Keikyu Kawasaki today. It is a satellite branch of Kawasaki NOVA. It was very calm and relaxed, and I was done early. I get to work here every Friday and Saturday in November, and hopefully longer! In 2003 NOVA was working on a massive expansion. Some of their advertising material included the slogan “learn English near the station”, so they decided to have an English school closer to a train station than any of their major competitors. JR Kawasaki station is a major train station on the Nanbu, Keihin Tohoku and Tokaido lines. It servies 185,000 passengers per day. The station is connected to a large, sprawling underground shopping centre. Having a large English school near Kawasaki station makes a lot of sense. Kawasaki NOVA usually had a roster of 22+ teachers and featured many classrooms, a voice room and two fully stocked kids classrooms. Keikyu Kawasaki station is a smaller station on the private Keikyu line. It serves about 58,500 passengers per day. 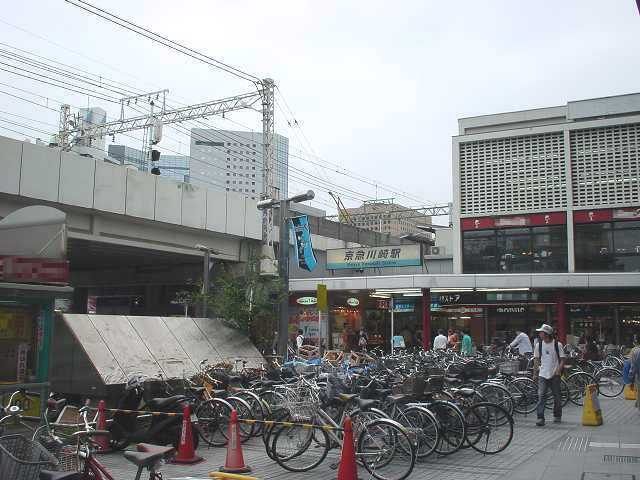 It is not connected to the underground shopping area and is only 500 meters away from Kawasaki station. Since one of the competitors opened an English school close to Keikyu Kawasaki station, NOVA decided to open a small branch slightly closer to the station. Keikyu Kawasaki NOVA usually had 3 teachers (rotated in from Kawasaki NOVA), and had one shared voice / kids classroom. Kawasaki NOVA had extra capacity and facilities, so there was no good busines reason to have another branch 500 meters away. NOVA’s “I’m closer to the station than you are” expansion policy in a country with extremely expensive real estate was likely one of the main contibuting factors to their eventual bankruptcy. That and gross mismanagement from the CEO, but that’s another story. As a teacher, I thoroughly enjoyed shifts at Keikyu Kawasaki NOVA, which provided a break from the fast pace and chaos of Kawasaki NOVA. This entry was posted on November 1, 2013, 9:00 am and is filed under Keikyu-Kawasaki NOVA, Teaching English. You can follow any responses to this entry through RSS 2.0. You can leave a response, or trackback from your own site.